The Lebanese Armed Forces organized on Sunday its annual race dubbed the “Raid Des Cèdres” (RDC), with around 1900 participants from across the Lebanese regions. The “Raid Des Cèdres” is a military Ski race, which is also open to all the people, starting from the Cedars of Tannourine, in the Batroun district to the Cedars of Becharre. However, Michael Haddad, a professional athlete who has lost control over 75% of his body, decided to take on another challenge by hiking to Qornet al Sawda, Lebanon’s highest peak at 3088 meters above sea level. 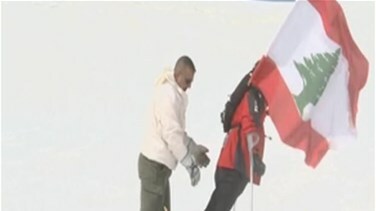 This is not the first time Michael Haddad defies his disability, but in June 2014, he climbed all the way to the top of the Raouche Rock where he hoisted Lebanon’s flag. He also broke many records in the past in his way to show that there is no such thing as an absolute barrier or handicap. At the age of six, he was subject to a spinal cord injury from a Jet Ski accident, which left him paralyzed from the chest down, 75% of his body is completely paralyzed. To watch Raneem Bou Khzam's report, please click on the video above.